While some crop pollination happens naturally, there's a commercial side to this as well. And that's where buzzing honey bees enter the picture. They represent by far the most commercialized provider of pollination services, with farmers across the world paying beekeepers to ferry their hives into fields of apples and almonds so that the bees flit from flower to flower, transferring pollen and allowing the fruit and nuts to develop. 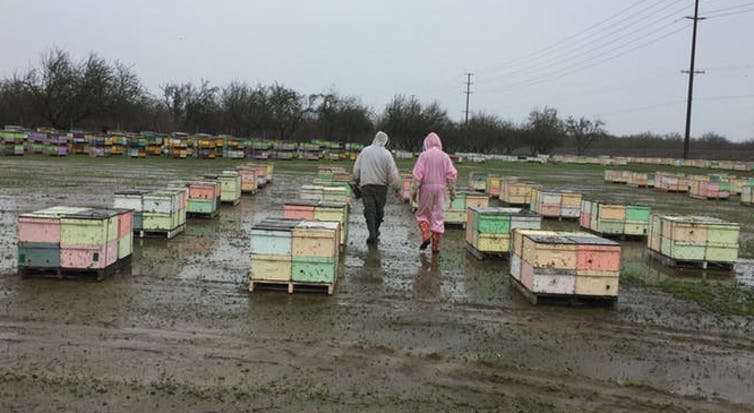 My own research has focused on the vital importance of honey bees to California's almond production, an industry worth US$11 billion to California's economy. And in fact, almonds are also vital to the health of American beekeeping operations. As the world celebrates Honey Bee Day on Aug. 18, I thought it'd be a good time to explore the economics of beekeeping. The actual population of honey bee colonies, however, has been little affected. That's because beekeepers have adjusted their practices by creating more colonies going into the winter months to deal with the high loss rates. Beekeepers can create more colonies by purchasing additional queens from honey bee queen breeders and splitting one colony into two. And more beekeepers closing down would be bad news for the world's food supply because many crops, including apples, watermelon, cherries and cucumbers, currently rely on commercially raised honey bee colonies for pollination. Perhaps no crop needs them more than California almonds. And likewise, no single crop matters more to beekeepers' bottom lines than California almond pollination, which currently makes up over a third of U.S. beekeeping revenues. California is the world's biggest supplier of almonds, making up 77 percent of all production in 2017. If you have eaten an almond recently, chances are it came from a tree in California's Central Valley. Roughly 1 million acres of almond trees collectively bloom over a three-week period every February, creating spectacular scenic views but also putting enormous pressure on the farmers to pollinate them quickly. 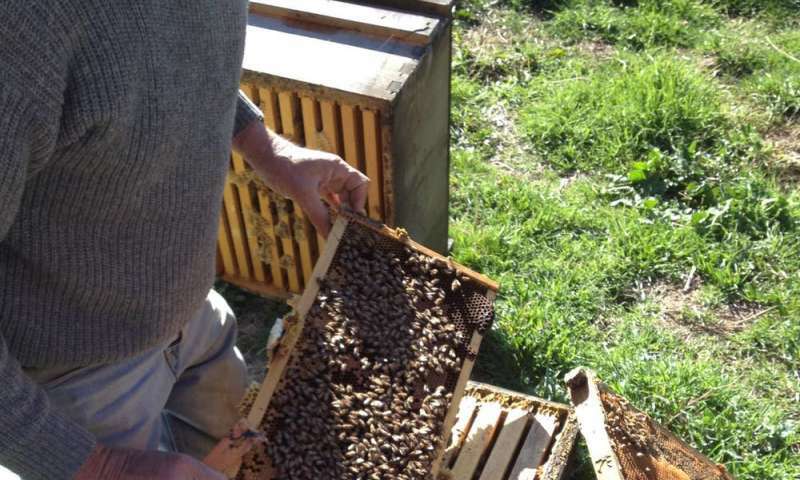 Each almond acre requires roughly two honey bee hives, each of which typically houses one colony of about 20,000 bees. With 2 million hives needed, that's well more than half of the total U.S. hive population. This is quite the logistical feat so let's take a closer look to see how it's done. The way they do this is to hire a third-party inspector to measure "colony strength." An inspector opens up some of the hives and estimates the number of bees within the hive by pulling out removable frames. The idea is that if a hive has eight frames covered with bees, it has enough strength to properly pollinate the trees in its vicinity. It's hard to overestimate the importance of California almonds to the stability of U.S. beekeepers' overall health.